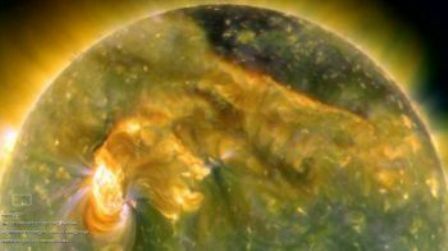 A “solar tsunami” eruption of plasma on the surface of the sun will lead a shower of ionized atoms to strike the Earth Tuesday or Wednesday night. Earth orbiting satellites detected that nearly the entire Earth-facing side of the sun erupted on Aug. 1 in a series of C-class solar flares, propelling one or possibly two coral mass ejections (CMEs). Rising from sunspot 1092, the solar flares may have a noticeable consequences on Earth aside from auroras being visible farther south than usual. The CME clouds, usually emitted from the sun over several hours, can carry up to 10 billion tons of plasma. They usually move away from the sun at about a million miles per hour, allowing them to travel 93 million miles to Earth in only three to four days, according to a NASA press release. Once they arrive at the Earth, they interact with the planet’s magnetic field. This may lead to a geomagnetic storm. Forecasters from the National Oceanic and Atmospheric Administration estimated a 10 percent chance of major geomagnetic storms and a 45 percent chance of some geomagnetic activity once the CMEs arrive on Aug. 3 and 4. Skywatchers in the northern United States and other countries should look north for a dancing celestial show of green and red lights.